Crush the peanuts coursely with mortar and pestle or mini food processor and set aside. Chop the spice paste ingredients and blend until fine. Heat oil and fry the spice paste until aromatic and smell spicy. Add the peanuts, tamarind juice, water, sugar, sweet soy sauce and stir thoroughly. Simmer in low heat while continue stirring for about 3 minutes until the peanut sauce turns smooth. 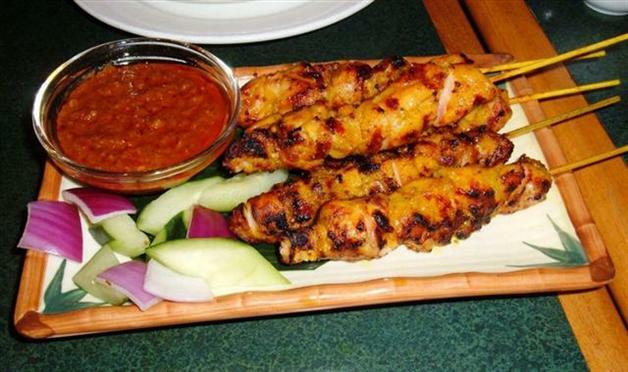 Serve at room temperature with the satay. For the peanuts, I used Planters brand Dry Roasted Peanuts. They are easily found at any food stores.